Headquartered in Shenzhen, LED Public Company is a leading LED manufacturer of High Brightness LEDs, SMD LEDs, Through-Hole LEDs, SMD/Through-Hole Displays, Circuit Board Indicators, and other LED related products. For over 30 years, LED Public Company adheres its core mission to dedicate technological innovations and vest in R&D projects developing full line high-efficient LEDs in compliant with RoHS and REACH Directives. LED Public Company exceeds many expectations worldwide with its unsurpassed manufacturing capabilities holding 4 manufacturing plants in China, all accredited with TS16949, ISO9001, ISO14001 certification. LED Public Company is committed to maintain our Quality/Environmental Management System to conform to the requirements of ISO9001, ISO/TS16949, ISO14001. To support its global reach, LED Public Company established sales offices & warehouse in the US, Europe, and across Asia to ensure first-rate service is provided to every customer. 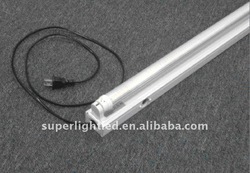 A convenient streamlined process is available on www.KingbrightUSA.com operating 24/7 online for easy access to LED Public's LED products.